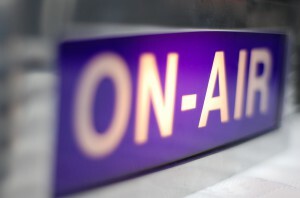 A few months ago, I was invited to join a new business radio program as the producer. In this case, “producer” meant lining up guests, and practically anything else I want or have time to do—only three of us were involved initially. The idea from the outset was to spread positive stories from the local business community (the Spokane, Washington area). Like a lot of you, I’ve learned that a company’s ability to tell its story is vital, so accepting the invitation to produce the program —Business Talks—was irresistible. 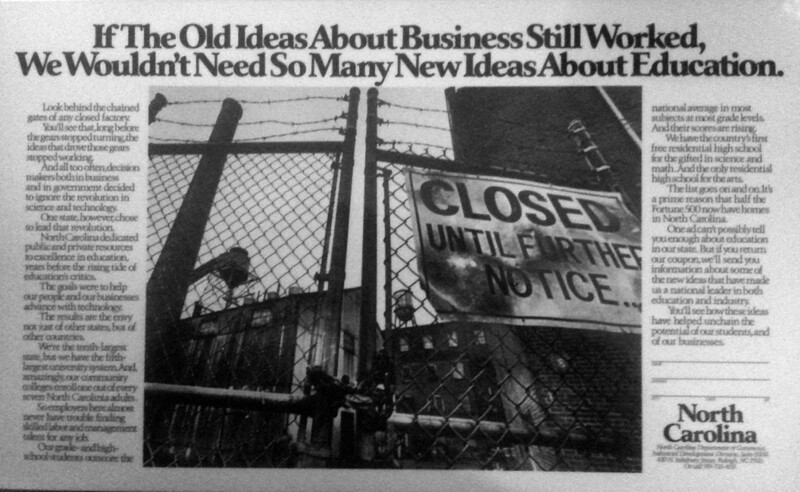 As a young copywriter, I was lucky to fall in with a good crowd: The Martin Agency, founded by Dave Martin in 1965. Dave passed away Tuesday. I didn’t know him well, other than he was a gentleman, a good father, humble and respected by all. It was a strange week. I read a lot of very good blog posts, but not many of the type that fit the profile for this weekly collection. To be precise: They should be at least somewhat related to marketing. You should be able to appreciate them whether or not you’re a marketing pro. They should be inspiring and/or educational. In other words, they should be just right for the weekend. So for this week’s 5, in addition to a couple of current articles about modern marketing, I looked back in time for inspiration. 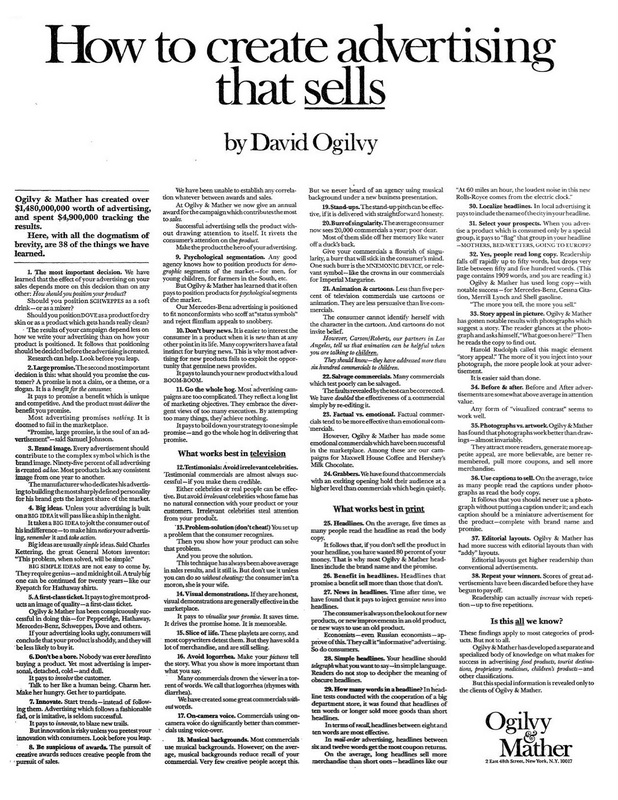 There’s wisdom from the late advertising great David Ogilvy, soul bearing from a grieving 16th-Century widow, and inspiration from one of my first bosses. It’s an ad about education. Please, oh please, no typoes! I just wanted to follow up my previous post about blogging – and how it’s not the end of the world if you occasionally make mistakes. Try to avoid them, of course. But don’t let the fear of mistakes keep you from posting content that’s vital to your strategy. Most online mistakes are fixable. Why is Coke’s message so smart? Strategically: It reflects everything the Coke brand tries to stand for: friendliness to all, “real thing” authenticity, and a distinctive taste in a world of wannabes. Tactically: It delivers the message to a captive audience that has a free sample the product right in front of it. The message is completely appropriate and relevant. It’s beautifully written and designed, and as engaging as a napkin can possibly be. The right message, to the right people, at the right time. Perfect. 1. 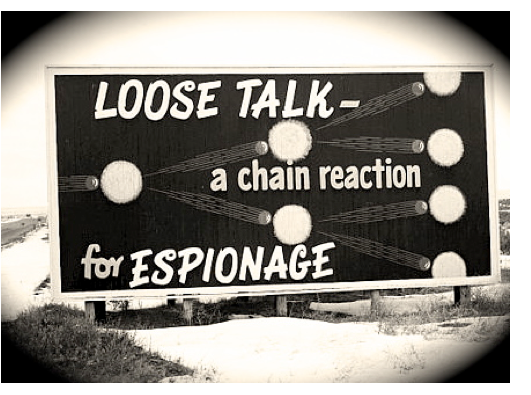 Work on your key (strategic) messages. If you think this message was simple and easy to produce — well, Coke and their marketing partners are so good at messaging that it only seems easy. Can you state your value proposition so easily? Does your company have a consistent voice and personality? These elements are central to your effective messages. Work on them and reinforce them — now, and constantly. A week or two before your trade show, or the day before your press release is due, is way too late. 2. Anytime, anywhere your company or brand interacts with your customers, there’s a profound opportunity. Never take “small” touchpoints for granted. 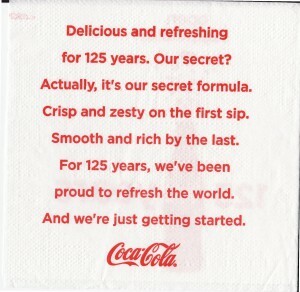 How easy it would be for Coke just to put a logo on the napkin, with an inane slogan. (I don’t believe “Open Happiness” is inane in any way, shape or form, but feel free to disagree.) This is powerful messaging where you’d least expect it. What are some small touchpoints that you’ve overlooked? 3. 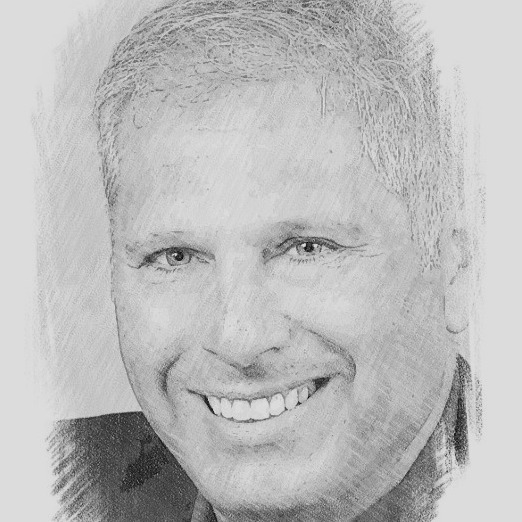 It’s harder than it looks to maintain market leadership in a commoditized category. Coke has a hard job compared smaller brands that talk to more focused segments. Yet Coke still hit home runs. Think about it: Red Bull and Mountain Dew have created their own sub-categories. With much more focused audiences, their job of creating relevant communication is relatively easy. (Red Bull and Mountain Dew are tremendously successful, that’s part of the lesson.) 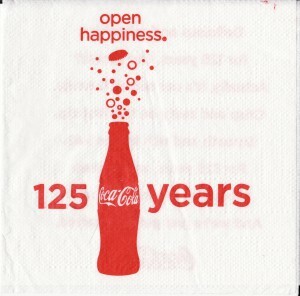 But Coke must connect with 12-year-olds as well as their great grandparents, and they do a great job. (Coke seems to be moving from “most liked” to “beloved” with their current efforts. Contrast this to the sad state of affairs over at Pepsi — their Super Bowl commercials, in particular). If Coke can rise to this challenge, how about you — whether you’re a market leader, or a challenger? Do you agree that this example from Coke is a particularly strong bit of marketing? What lessons do you take from it? How do you respond to misleading information spread by your competitors? This video provides one simple example. I like how they’re not angry or obnoxious (as I’d be tempted to be). 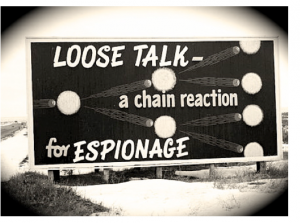 They use a low-key approach with disarming good nature to nail the message. Sure, the presentation could be better, and I wish they could have taken Paramount Equity Mortgage to task more directly. But I give the two young mortgage brokers a lot a credit for standing up for themselves. Does one video posted to YouTube solve the problem of competitors who mislead the public? Of course not. Some people will always weigh the pros and cons of playing dirty. They’ll figure out how much they can get away with and go just that far. As social media continues to empower consumers and small competitors, the unscrupulous will look for new and creative ways to cheat. So while I applaud the video, there has to be more. Imagine if every honest company, small and large alike, policed their own industry like Brandon and Cliff tried to do on their own. 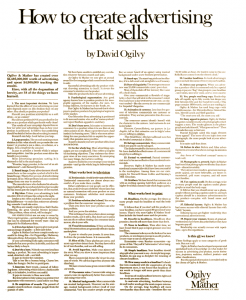 Imagine if an entire confederation of honest companies cooperated in showing customers how to recognize and deal with questionable sales tactics. Eventually, I think that will be rule, rather than the exception – and it will be a lot harder for the bad guys to win by cheating. I sure hope so. Maybe I’m wrong. (I don’t think so!) What about you – do you think companies should respond when they find competitors lying to their customers? If so, how? Note: from the looks of things, Revolution Financial seems to have gone out of business. But I have a feeling Brandon and Cliff will do well in the long run if they keep using the same instincts that led them to post that video.